Not sure if you will remember but we got four suits from you a couple of months ago for my wedding? 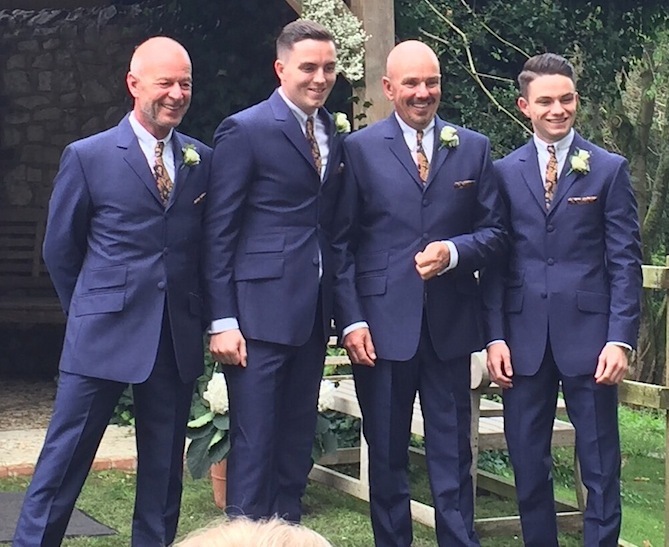 Just to say it all went off without a hitch and the suits, and accessories, just blew everyone away – we all felt the dogs and rightly so as I think it’s fair to say that they looked top notch and the look just spanned the generations from the old gits to the toned young things!! I got SO many comments about where the suits had come from! My missus was just stunned by look having been a bit sniffy about a potential ‘retro’ look and cried her eyes out at how good me and the boys looked. I can’t thank you enough for the unique situation that you allowed me to create – I even kept the tie on until midnight – I just couldn’t spoil the look! I hunted for an age for some ‘pukka shmutter’, I looked at the usual suspects like JTG, Aceface etc. but then I found Adams Sheners ‘Aladdin’s Cave’ of fine clothing whilst walking down the Portobello Road one day. So I stepped inside his shop, feeling a bit like Mr. Benn & found what I was looking for, top quality authentic Mod/60s suits (which are cut to perfection) shirts, coats & accessories which are produced using only the very finest British cloth. Suffice it to say, I am now a total devotee of Adam Shener¦ A big thanks to Adam, Ritchie & Jeremy. Staff Jeremy and co are superb friendly, chatty and very knowledgeable and proud of the products they sell and rightly so. Purchased 2 off suits both needed alterations to trousers which were carried out very quickly (at a small cost). Attention to detail and quality are top notch. Tried a number of suits on with Jeremy being spot on with his view on suitability for me spending some good time to ensure I purchased something that was correct for me, making boots and shoes available to try with suits and to get correct trouser length. The quality of their product is second to none and at what I consider to be good value, suits to last. Will I be visiting again to purchase? Most definitely AND will be recommending to friends. The shop is a few minutes’ walk from Ladbroke Grove tube station, went on a Saturday when street-market was on which is well worth a couple of hours wandering around if adjustments to clothing are required. Top quality, top staff, top, top shop. I ordered a suit off of you late last week. Delivered to my work this morning. That is no mean feat as we’ve been fog-bound in Jersey for most of the last week. They’re thinking of twinning St Helier with Brigadoon it’s been that foggy! From ordering it, to receiving it the service has been absolutely brilliant. I know you pay a bit extra, well quite a bit extra, but I’ve got stuff from you that’s 5 years old and it looks pristine still, unlike some suits that I’ve had from other places that have fallen apart after a year. Fantastic quality, and a classic design which means I can wear it for years and it will always look great. I’ll fall apart before the suit does.“ Thank’s Folks! Took a look around with my mate, ‘Big Dave’, on a Saturday and left a few quid lighter. Excellent place and a genuine and friendly service. The guys could not do enough for us. Some really natty threads and great quality as well. Even had a call from Richie later (cheers mate) regarding a response to an enquiry that I had. Quality and service together: rare enough on their own in this day and age however, together? Almost unheard of; I will definately be back! I bought a suit and Crombie from Adam for the opening night party of ‘Our House the Musical’ after seeing the suits and coats which Adam supplied for the show. That was 11 years ago and I still have it and wear it regularly! I wore it to the 10th anniversary of the show last year! “Called in Friday for a whistle, to see Jeremy, who sorted me out with a great suit. Knows his clobber. Great shop”. “Vidur Sahney, San Francisco, U.S.A.